Reid Peterson was elected a Fellow of the American Institute of Chemical Engineers (AIChE) for his significant professional accomplishments in nuclear waste processing. Peterson will receive a pin and plaque at the AIChE’s 2017 National Meeting, held in Minneapolis in October 2017. “I have been a member of AIChE since I was an undergraduate, and I have served a number of roles with the organization—including local section chair and division chair—so to be nominated by my peers and then elected by the AIChE’s Board of Directors is quite an honor,” Dr. Peterson said. Peterson joined PNNL in 2004. His work centers on the field of waste processing for treatment of high-level waste. Specifically, Peterson has more than 20 years of experience working on processes to treat high level waste, including supporting the Hanford Waste Treatment Plant as a program manager for the past four years. 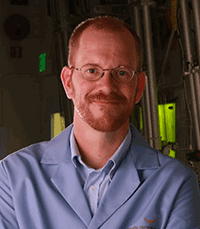 Much of his research is conducted in the Radiochemical Processing Laboratory (RPL) at PNNL. In addition to his service to AIChE, Peterson continues to help develop the next generation of engineers through middle school math enrichment, contributing to the effort as a member of the Team Battelle Math Club Mentors and as a math coach. Peterson holds a PhD in Chemical Engineering from the University of Wisconsin-Madison.